Last Friday, the Federal Communications Commission held a hearing about Media Ownership at Stanford University. It is part of an ongoing requirement that every three years, the FCC take public comment about who owns licenses to broadcast, what rules license holders should follow, where underserved communities lie, how to balance business needs with the needs of the democracy, and why the public interest is paramount. Hearings in 2007 overflowed with several hundred angry citizens, demanding the right to solid information to protect our democracy. The 2010 Stanford hearing attracted only about 200 people throughout the course of the day, and mainly featured representatives of media reform groups Free Press, the Media Alliance, Prometheus Radio, Davis Media, and news gatherers from Poor Magazine. But many media activists in 2007 thought their battle was against the Bush Administration's FCC. In truth, many of the powers to be at the FCC remain the same as.with the Obama Administration. And the issues raised back then by activists have not yet been resolved, and have in many ways worsened. The conversation has shifted some since the 2007 hearings, but it still goes back to the effects of increasing consolidation of media ownership. In 2007, media activists tried to prevent newspapers and TV stations from having the same owners, fearing that shared news organizations would simply cut journalists in order to increase profits. Three years later, the activists have lost ground in that battle, and now are seeing their greatest fears realized: journalists, the gumshoe reporters that hold government accountable to We the People, are being fired in record numbers. The corporate ownership argument is that the internet is providing platforms for multiple journalists to do their work. The reality, as pointed out by panelist James Hamilton, Professor at Duke University, is that when news consumers surf the web, they still seek out the same well known mainstream news sources they have always known. So the opportunity for breakout investigative journalism is relatively small, while the need for maintaining strong journalism in traditional media, both broadcast and newspapers, is essential for our democracy. Panelist James Joyce, President of Communication Workers of America, cited his organization's research about the direct effect of what happens when local TV stations are allowed to have "shared services agreements" Half of those stations newsrooms are typically shut down, resulting in fewer reporters and one less point of view about the local community. He also cited the troublesome new development of "Local News Sharing," where various TV local newrooms share one crew to report on a given local story. Again, this is a way to cut station costs. Cutting newsroom staffs by 50% saves a lot of money; but it is important to realize that stations are earning 20-30% profits. Shareholders are thrilled, especially in this economy; but is the public interest really being served? Remember, broadcasters are licensed to "serve the public interest, convenience, and necessity." If they do not do so, they can and should have their licenses stripped away. It's a rule that both the corporate owners and the FCC prefer to ignore. But James Joyce tied the decline of newsrooms to the issue of licensing. Shared service agreements allows one local station to take over operation of a second local station, effectively transfering a broadcast license to a competitor without having ever having to file with the FCC. So licensing and ownership are inherently tied together. Which brings me to my own testimony at the Stanford hearing. 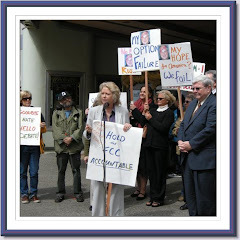 For many months, I have been covering the FCC response to the trial of Sacramento's Entercom radio station, KDND, which a jury found liable for sponsoring a reckless water drinking contest that resulted in the 2007 death of 28 year old wife and mother, Jennifer Strange. The attorney for the family asked that the station's license be revoked; the FCC responded it would look into the matter, but never acted, and instead has since rewarded Entercom with 14 more station licenses. Entercom's 2008 Annual Report states that all six of its Sacramento licenses are being challenged, but advises investors, that based on past FCC actions, they are confident that they will maintain their licenses. In other words, a corporation that owns a broadcast station can act so recklessly that they believe they can kill someone and still maintain their license to broadcast to millions. I brought up this issue quite forcefully at the Stanford hearing, in front of William Lake and William Freedman, the very people who run the media bureau, the same people who actually control license challenges. This is the same bureau which responded to my Freedom of Information Act request on the issue of license challenges, saying that they had no idea how many challenges are pending in front of them, nor do they remember the last time they actually took a station's license away. Here's where it gets interesting: Immediately following the hearing, I was interviewing Mr. Lake on camera, and took the opportunity to ask about the these license challenges, (formally called "petitions to deny licenses.") After just two questions, which an uncomfortable Mr. Lake struggled to answer, the Bureaus' Public Relations person, Janice Wise, cut me off. "Questions," she said, "must be restricted to the topic of this hearing." So somehow, the Obama FCC Media Bureau, which decides which corporations get to own broadcast licenses, does not see a relationship between media ownership and broadcast licensing. The national conversation around station licensing is to make broadcast stations once again renew their licenses every three years, rather than eight, as is the rule today. But eight years or three, if the FCC abjectly fails to hold stations liable for reckless actions, it is just an agency in the pocket of the corporations it is supposed to oversee. And the Media Bureau appears to act independently of whichever party is in the White House. Do not forget, We the People have the right to challenge station licenses. We need to do so often, and publicly. We need to remind the real Washington media establishment who they are working for: us. See more on these issues my blog, www.SueWilsonReports.com , and a recent McClatchy Newspapers Sacramento Bee article. Sue, good work! Too bad they think they work for the corporations. It looks like Entercom's gambit to just fire everyone connected to the station worked. That is the lesson that future license owners will learn. It ain't over till it's over, and we are just beginning to fight. The FCC doesn't like it, but we the people do!